To be honest, I can’t remember much that happened to me in grade school. I do remember, however, I loved studying about space. 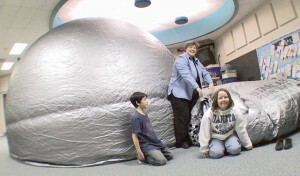 Once a year in grade school, we all had the grand honor of visiting our school’s planetarium in the library. It was an inflatable igloo shaped thing, and once you crawled through the dark tunnels – industrial fans humming away in the background- you entered into the center dome and saw the awe of glow-in-the dark projections of stars. This is like the one I remember from my former grade school days. Don’t be fooled, inside it is pure astronomical enjoyment. I blame this plastic blob for my love of stars, and so today, I bring you information about the much heard about, but little known, supernova. A supernova is the death of a star in a big explosive way. In general, most stars die quietly and eventually fade away into lifeless celestial objects known as white dwarves and from there fade even further away until they are known as black dwarves. A supernova, on the other hand, is both big and hot enough to go out with a bang. Now to get a bit more technical. In order for a star to explode, it must produce energy by fusing elements. The huge gravity of a star causes the formation of oxygen, silicon, phosphorous, calcium, and eventually reaches to the formation of iron. This is where it dead ends. Iron is heavy and to burn it requires energy (rather than producing it). Here, gravity comes back into play. With nothing left to burn, the star begins to collapses into itself. The massive ones can form black holes, and the ones a bit smaller (think 5-8 times the size of our sun) explode. Explosions are great to watch – from a safe distance – and supernovas are no different. The explosion lasts 15 seconds but leaves a long enough lasting impression to light the galaxy for months! If you want to see one, click here to watch the Crab Supernova explosion on YouTube. It’s a big bang kind of explosion, and it’s speculated that the big bang existed because of supernovae. I may not get to visit another planetarium for awhile, but at least I can still get a quick space fix here and there. Maybe next week, we’ll look at black holes. Have a great day all! Have you ever visited a planetarium? What are your thoughts on supernovae? Cool! This is fascinating information!